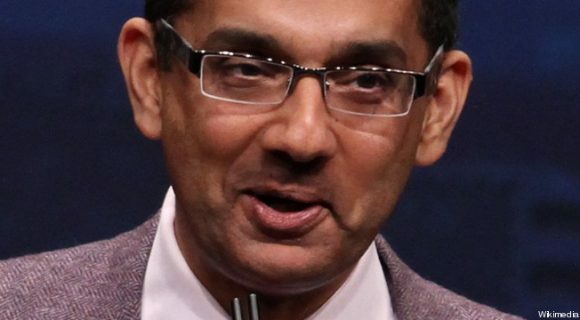 Dinesh D’Souza is not one to shy away from public debate or controversy. The New York Times recently called D’Souza a “lightning rod” for his public profile as a conservative Evangelical and now as a filmmaker (D’Souza’s recent film 2016: Obama’s America has become the second highest grossing political documentary of all time, only behind Michael Moore’s Fahrenheit 9/11), however D’Souza is now finding himself in the middle of a controversy that he did not orchestrate himself. Last week, World Magazine, a Christian publication, reported that D’Souza appeared to be having an affair on his wife of 20 years with a women 20 years younger. The breaking of this story resulted in a number of predictable and unfortunate fallouts. To begin with, the story forced D’Souza to resign from his position as President of King’s College, a small Christian college in New York City, a position he has held since 2010. Unfortunately, D’Souza’s resignation as President is the only part of the fallout that is relatively straightforward – unless, of course, you are intimately connected to King’s College. Since the story broke, D’Souza has spoken out against World Magazine claiming that Marvin Olasky, the editor of World, and Warren Smith, writer of the story, both have a history with D’Souza at King’s College and that their “misleading, sensational story” was an opportunity for them, and Olasky in particular, to “continue his vendetta” against D’Souza. D’Souza makes a number of strong points as it appears that key details in the story had been conspicuously left out. First, it was not made clear that D’Souza and his wife had been separated for two years. Second, D’Souza and his alleged mistress, who also happened to be his fiance, never shared a hotel room as it was implied. And third, D’Souza claims he never said “nothing happened” when he was asked about the incident with his fiance. However, I believe that D’Souza’s defense, while necessary at times for journalistic accountability, misses the whole point of the controversy. Commentators have and will continue to disagree about the moral and ethical implications of D’Souza’s actions. Was D’Souza wrong to get engaged while still legally married to his wife? Some (including myself), say yes. Others (including D’Souza), say no. It is here where I believe D’Souza misses the whole point of the controversy. D’Souza’s attempt “to avoid even the appearance of impropriety” is a moot point because he should have done this before there was even an opportunity for controversy. Aren’t we Christians, in the spirit of 1 Timothy 3:2, called to live above reproach? And isn’t this what St. Paul was after in 1 Corinthians concerning food sacrificed to idols when he said, “Everything is permissible – but not everything is beneficial”? The fact that D’Souza could not forsee any potential “appearance of impropriety” points to the fact that he is worried about what is permissible when instead he should be worried about what is beneficial. The world is much too clever to fall for any double standard that Christian’s put forth, so if D’Souza or any Christian wishes to be a public figure with a public voice, they better be able to back it up with more than just words.